Do you want to learn Hindi? Rajeshwar (Raju) Mukherjee founded Pragati Hindi classes in 1999. Since then he has taught Hindi to many visitors to Varanasi keen to learn the national language of India. As an experienced Hindi teacher, Raju is enthusiatic about teaching Hindi and can offer you excellent Hindi lessons tailored to your needs and timescales - all based in the historic and ancient city of Varanasi. If you want to learn Hindi in Varanasi Pragati Hindi classes can cater for your every need. Why learn Hindi in Varanasi? 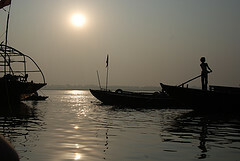 Varansi (also called Benares or Kashi) is a marvellous place steeped in history and a very special place to visit. Learning Hindi in this ancient city gives the visitor greater access to the local people and traditions that make it so famous. 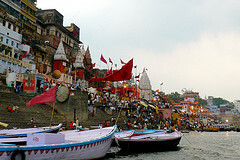 Even speaking a little Hindi while in Varanasi will enhance your stay tremendously. Learning Hindi with Pragati Hindi Classes offer a chance to spend time in this ancient city and understand more about the lives of its residents by building your Hindi communications skills. 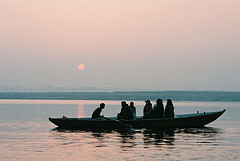 Many of our students have returned time and time again to learn more from Raju and visit Varanasi once again. Taking Hindi lessons with Raju in Varanasi you will have ample opportunity to practice your skills during your days here. Varanasi is a major destination for vistors to India and the one place all devout Hindus must visit at least once in their lives. 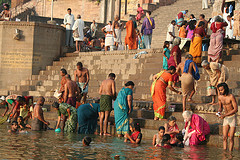 Life in Varanasi revolves around the holy river Ganges where pilgrims take their holy bath each day and offer blessings to the river.